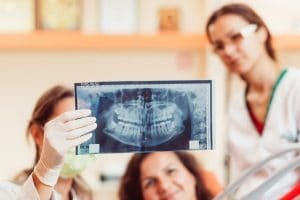 What’s the Difference Between Dental Bridges and Dental Crowns? When you want to improve your appearance and your oral health, you may be thinking about dental treatments. Crowns and bridges are two different types of restorative dentistry, and they are used for different purposes. Crowns are used to restore the condition or appearance of a tooth. A crown can be attached to the tooth to make it stronger, restore a tooth that has been damaged by a cavity or filling, or to cap a tooth that is misshapen or discolored. Crowns can also be used as a part of a dental implant. After an implant has been placed in your gums, a crown is attached to the top. The crown is the part of the implant that is used for chewing and looks like a natural tooth. A dental bridge is used to replace one or more missing teeth. The bridge is made of an artificial tooth that is permanently attached to the adjacent natural teeth. As it is permanently in place in your mouth, cleaning a dental bridge is no more difficult than cleaning your natural teeth. The second type of dental bridge is the removable bridge. Removable bridges are sometimes referred to as partial dentures. Similar to traditional dentures, a removable bridge should be taken out of your mouth regularly for cleaning. The difference between crowns and bridges depend on your particular situation. Whether you want to improve a natural tooth, obtain an implant, or replace missing teeth, these types of restorative dentistry make it easy. Crowns and bridges are simple procedures that your dentist can complete in a relatively short period of time. You can have better oral health, look much nicer, and enjoy many nutritious foods that you cannot easily eat with damaged or missing teeth. Call our office if one of these dental treatments is right for you. Thanks for explaining what a dental bridge is. My mom has a few missing teeth and my dad mentioned to her that she might like getting a bridge to fill the gaps. I didn’t understand, but after reading your article, that is so cool to know they can make a bridge to fill in the gap with artificial teeth. Hopefully, she can find a dentist and maybe get a dental bridge.